Some fun quick announcements for you! I have a NEW venture... online video workshops!! I've partnered with my publisher, Leisure Arts, to create online workshops that you can do in your home.. in your jammies.. how fun is THAT! My first two videos are now available. A paper piecing workshop and a curved piecing workshop. At the new website you can watch my fun promo... then click the individual workshop intros and project photos. There is going to be a button on the side bar and a link on the workshop page so you can always find my classes. Working on that next! Earlier this year I welcomed a George Quilting machine into my studio... LOVE this machine! At the end of February I paid a visit to the APQS offices to visit George's home. It was great to see the show room, meet all the people involved and have time to work with both Dawn and Mark on the ins and outs of the my new sewing machine! George is fabulous and very happy in 'his' new home. 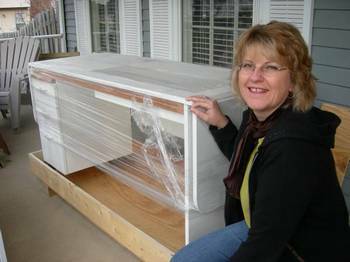 Top photo is the George table as it is delivered. Drop in the sewing machine and it's all ready to use! The photo on the right is the show room in Des Moines Iowa. It was buzzing the day I was there! 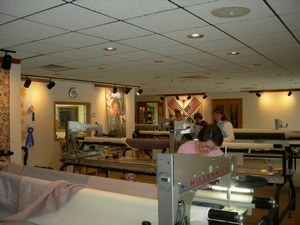 Several quilters were working on charity pieces, so it was wonderful to see the machines running. Besides learning about George I had time to play with the Lennie on the frame. Check out all George's features HERE AT the APQS website.